Showing 35 articles from April 28, 2014. SOUTH BEND – As of Monday, Cedar Street in South Bend will be closed for construction. Cedar Street is the street that drivers use while leaving the hospital and Alder House. 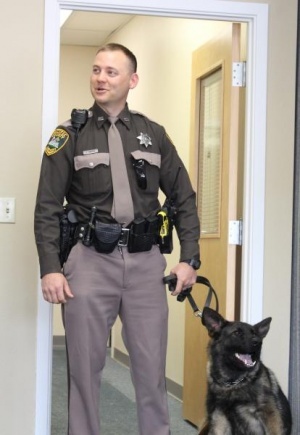 Photo by Scot Pearson Pacific County Sheriff Deputy Justin Kangas escorts the newest recruit, Ciko, to the Pacific Conty Sheriff’s Office. SOUTH BEND – During the normal Pacific County Commissioners meeting, the members took time out of their regularly outlined agenda to greet the newest recruit to the Pacific County Sheriff’s Office. Photo by Scot Pearson Phil Davis stands with his recent award for his agency serving 60 consecutive years. 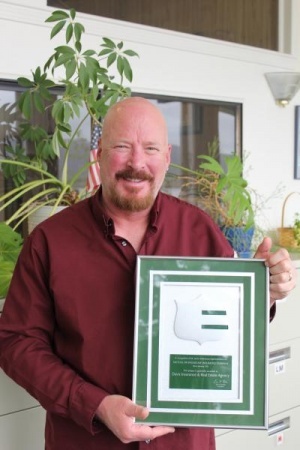 SOUTH BEND – The Davis Insurance & Real Estate Agency of South Bend was recently recognized as one of the longest consecutive agency’s working in representation for Mutual of Enumclaw Insurance Company with their 60 years in the business. State shellfish managers approved a series of razor clam digs beginning Sunday, April 27, at Twin Harbors and Long Beach. At the latest Raymond City Council meeting April 21, the meeting moved swiftly onto the question of adjusting the current fee schedule, Resolution 1227. MENLO – As long as dry weather forecasted in Pacific County holds, travelers on State Route 6 will start using the new, wider Willapa River Bridge by Wednesday, April 30. Are you missing out on Family Story Time? Library Manager Jamie Allwine (background) leads Family Story Time Friday at the Winlock Timberland Library. Part of a weekly program ending May 16, Family Story Time is geared toward children age 6 and younger and their families, though all ages are welcome. Featured are classic stories from around the world, as well as rhymes, songs and movement games. With just three sessions left, Family Story Time will be taking place May 2, 9 and 16 from 10:30 to 11:15 a.m. For more information about these and other events, call the library at (360) 785-3461. Chemotherapy, radiation and the mere diagnosis of cancer can sap your strength, but one local woman has been imbued with the encouragement of her friends and, in the midst of treatment, is planning to participate in Lewis County’s upcoming Relay For Life. Though Winlock resident Laurie Carlson had been diagnosed with breast cancer in January and is on the tail end of a five-month chemo regimen, she has been building a team with the help of friends, and is currently expecting to bring 17 racers to the track on May 16 as Team F.H.L. (Faith, Hope and Love). Castle Rock will be hosting a ribbon cutting and volunteer celebration Thursday, May 8, to celebrate the completion of the Front Ave. construction project. Scheduled to start at 8:30 a.m. at the intersection between Front Ave. and Huntington Ave., the public is welcome to attend this event acknowledging the great deal of planning and resources invested in refurbishing the street. 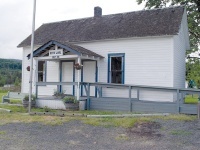 The May Lewis County Genealogical Society meeting is Tuesday, May 20, 2014, at 7:00 p.m. in the P.U.D. Auditorium at 345 Northwest Pacific Avenue in Chehalis. If you want to know how to use the Legacy Family Tree genealogical program or are trying to decide which program to purchase, this is the program for you! Already have Legacy Family Tree? Want to know how to use it effectively? Wonder how to enter this, edit that, or find something? May Day’s grand marshal this year will be long-time resident and City Councilor Andy Wilson, and he said he is looking forward to a successful May Day both this weekend and in the future. Having moved to Vader on a permanent basis in 1963, Wilson said he has seen May Day evolve from when its founder, Lena DeAger, was still organizing the festival, after having begun the annual tradition in 1952. 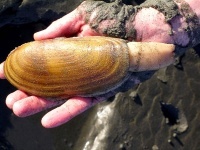 The Washington Department of Fish and Wildlife has announced razor clam digs for the coming days as forecasts predict sunny weather reaching into the 80s. The weekend of May 9 and 10 marks Ryderwood’s Spring Craft Fair - another opportunity for visitors to come out to the end of SR 506. Along with some of the finest hand-crafted arts and crafts in Community Hall (check out “The Nest”, too! ), there will a RWCS Bake Sale and Women’s Club lunch served in the kitchen. For more information about this event, call Marty at (360) 295-0096. As part of our annual program, Lewis County residents will be eligible to obtain vouchers for free disposal of up to 1,000 lbs of household refuse beginning May 1. Vouchers will be available until Sept. 30, however Lewis County Solid Waste Manager Steve Skinner says residents should wait to obtain a voucher until they are ready to use it because, once issued, the voucher expired after 30 days. Vader’s historic City Jail will be among the attractions available during May Day, with tours and photos facilitated by the Vader Citizen’s League. In celebration of National Poetry Month, the Winlock Timberland Library held an all-ages poetry contest, collecting submissions between April 1 and 15. During that time, 79 entries were submitted by residents from around area, ranging in ages from 5 to 96 years old, and the library says they are proud to share the winners and runners-up for the contest. It’s 1999 and Lincoln has just started a swing job as an “internet security officer” for an Iowa newspaper. Is he prepping for the Y2K changeover? Kind of. Mostly, he’s reading other employees’ emails. Beth, the movie reviewer, and Jennifer, a copy-editor, know that they’re not supposed to use their work email for personal conversations, but when their messages get flagged for review Lincoln can’t bear to warn them. It’s not long before their witty banter and stories become his favorite part of the day. It was great to see so many visitors in Ryderwood over the Garage Sale weekend. I rescued a few treasures that haven’t left Town (yet! ), but it didn’t look like many went away empty-handed. The beginning of a new month means another Town Breakfast on Saturday from 8-10 a.m. Hosted by our VFW and AMVETS guys, you’ll find the finest breakfast fare around: eggs anyway you like them, sausage or ham, biscuits & gravy – and pancakes! Orange juice and bottomless coffee are always included - there’s not a better deal anywhere! Toledo Senior Center collecting good used items for Second Time Around Sale during Cheese Days 2014. Contact diana.haug@lewiscountywa.gov or (360) 864-2112. Tuesdays Paula Raupp continues 5-week Quilted Purse Class 1-3:30 p.m. at Toledo Senior Center. Cost $30. For info, call her at (360) 864-4901. May Day is arriving this weekend and all indications say the weather should be clear. With highs reaching into the 80s later this week, we hope it gets to stay that way, come Saturday. It is still not too late to add yourself as a vendor or parade entrant, so call organizer Janet Chalrton at (360) 295-3011 for more info. Also, remember donations of cakes for the cakewalk should be dropped off between 10 a.m. and noon Friday at Andy Wilson’s house for inclusion in the festival. Park Board Chair Steve Krohn was pleased to announce the concrete for a new basketball court in Werden Park was poured Monday, thanks to the efforts of many donors and volunteers. Several other improvements have been planned for the city, so be sure to thank a member of the Park Board the next time you see them. As they say, “April showers bring May flowers.” I can’t wait to see all the flowers here in the country. There is nothing more beautiful than taking a drive around Winlock to see all the gardens take their shape. Of course, what would the month of May be without talking about “May Day” and how it started. May Day began as an ancient Northern Hemisphere spring festival, this is said to have taken place before Christian times. May Day is best known for the tradition of dancing the maypole dance and crowning of the Queen of May. The Willapa Harbor Lions Club will be taking up Helen Keller's challenge to become "knights of the blind." Castle Rock has been awarded a $170,000 rural economic development grant for a new Visitor’s Center at Exit 49, and construction of the facility is expected to begin this fall. Though a little less than the $184,000 the city had requested in their application to Cowlitz County, Public Works Director Dave Vorse said this amount will none-the-less allow Castle Rock to move forward with building the center, adding the city is grateful for the significant contribution of funds. The Vader City Council has approved a new nuisance enforcement ordinance they say should enable city officials to effectively compel violators to take corrective actions while clearly defining methods for imposing penalties. Effective enforcement policies have been a significant goal for Mayor Ken Smith’s administration during the last few years, and he told the council during their meeting Thursday this new ordinance, crafted by City Attorney Carol Morris, should alleviate concerns that the city is powerless to enforce its own rules. Construction of Toledo’s new Wastewater treatment plant began last week and an official groundbreaking ceremony is scheduled for Thursday morning. Exacted to last 16 months, construction of the plant has been the ultimate goal of more than six years of effort by City Hall to identify and fund an upgrade to Toledo’s aging lagoon system. I was determined in 2011 that a new oxidation ditch system would be the most appropriate solution and, in 2013, the city was able to secure $6.4 million in county and state grants, on top of loans, to complete the project, which has been estimated to cost around $9.6 million. The Cities of Vader and Toledo are currently seeking members of the public to volunteer for service on their planning commissions, and interested parties may apply at City Hall. Vader has recently been advised by legal counsel to reconstitute their planning commission, while Toledo is seeking to fill vacancies on their commission so the body may maintain a quorum. Winlock officials say Fir St. Bridge may not be replaced until around 2016, given current funding timetables, though a temporary footbridge is being pursued to help restore access across Olequa Creek. In an interview Friday, Mayor Lonnie J. Dowell said the city will not likely know the approval status of a grant application to the Federal Highways Bridge Program until around the end of this year, and that the engineering and planning necessary to prepare for bridge replacement, among other tasks, will likely not be complete until another year after that. A rundown of local games for the week of April 21. Some small town kids want adventure. Many choose the exciting life of a big college campus in a large urban area. 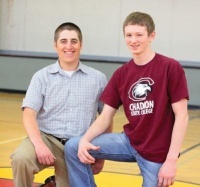 Winlock High School Senior Tony Raupp has his own ideas about what a college should be. "They are a small town like us," explained Raupp. "I have been there once. I remember the campus when we drove through there." Authorities were forced to burn down a barn near Winlock today after the owner found a cache of “extremely deteriorated and volatile explosives,” according to the Lewis County Sheriff’s Office. 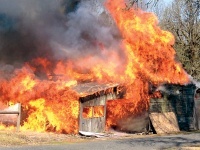 In a news release published this afternoon, it was reported the owner of a barn on the 100 block of Hart Rd., northeast of Winlock, had been cleaning the building and found explosives which authorities believe had been left behind by a previous property owner, noting they were likely several decades old. A Longview woman was cited after crashing her car near Toledo Sunday, according to the Lewis County Sheriff’s Office. The 34-year-old driver of a 2002 Honda Oddesy had been traveling on the 200 block of Jackson Hwy. when she swerved to miss an animal in the roadway, first striking a guardrail then crossing the center line and striking a barbed wire fence. Lewis County Fire District 15, in Winlock, celebrated the achievements of their top EMTs and firefighters with a ceremony held April 5. Among those honored were Firefighter of the Year Jarryd Forler, EMT of the Year Karen Fenstermaker, Top Rung award recipient Dan Smith, Top Responder and recipient of the Commissioners’ Award, as well as a certificate of appreciation, Rod Fenstermaker, who had been involved in 126 incidents during 2013. Boaters 59 years and younger are now required to possess a valid boating safety card when operating a vessel with a 15 horsepower engine or greater. Mandatory Boating Safety Education became a reality for Washington boaters six years ago. Deputies from the Lewis County Sheriff’s Office will be hosting a free Safety Education class on Saturday, June 7th. The class will be offered from 9:00 am to 5:00 pm at the Lewis County Sheriff’s Office Training Room located on the first floor of the Law and Justice Center, 345 West Main Street in Chehalis. Lunch is not provided, however, there will be a lunch break during the class. Kick off the Community Farmers Market's 10th season with a celebration where farmers, vendors, and customers can mingle over seasonal tapas prepared by Chef Chris Klickman. There will also be a no host wine bar, live music, and door prizes. "Bite Night" will be held on Friday, May 16th at Santa Lucia Coffee Roasters from 6:00-8:00PM. The informal event will feature local spring foods offered by market vendors. "We are excited to showcase our market's tenth season and give the community an opportunity to meet some of their local farmers and vendors," said Rachael Reiton, Market Manager. "It'll be a celebratory evening that makes a great night out for couples, group outings, or families who want to enjoy delicious local fare while also supporting small businesses and their local farmers market."